My bright and cheerful Harvest Moon rug is ready to be given to my friend, Josephine Alexander, on Friday. I fixed the back of it so it can be hung on the wall. Jo’s walls are filled with the most beautiful array of paintings, decorative goddess plates, and her mosaics. I’m guessing she’ll have to do a bit of rearranging to find a spot for this rug. I will be hosting my Breakfast Club ladies on Friday. I love this group of women, who are so creative and supportive. I am always thankful to have them in my life here in Pennsylvania. Jo will bring the pumpkin mosaic she made for me. I cannot wait to see it in person! I will post a photo of it in situ next Monday. Jo is an amazing artist and you can check out her mosaics on Facebook under her business name, Grandmother Moon Mosaics. She is truly amazing! 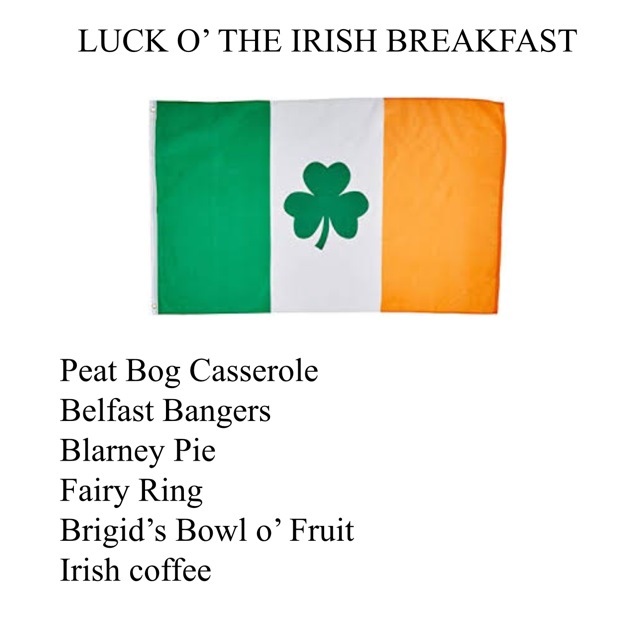 Speaking of Breakfast Club, although March is almost over, I’m doing an Irish themed meal. My menu is below. I love hosting this group, since breakfast is my favorite meal and there are so many variations of foods to make. We are pretty adventurous and often have things that are not traditionally served at breakfast. We think outside the box! There’s a lot of beauty out there and in a diverse group of wonderful women. Harvest Moon 22” x 40” all bound and ready to go. 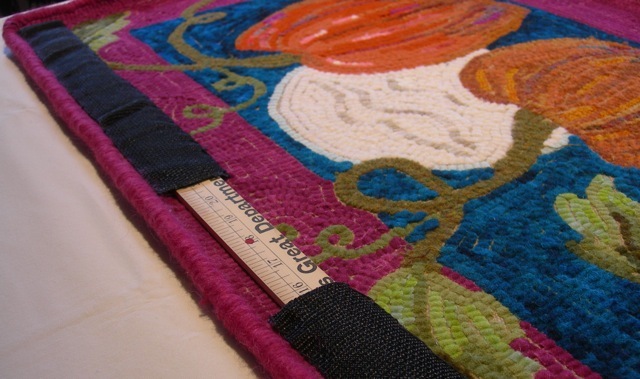 I sew nylon webbing onto the back and insert a wood lath or yardstick with a hole drilled in the middle. It can then be hung on a hanger pushed into the wall and moved side to side to straighten it. It will be an Irish theme with green and orange colors. Slainte!